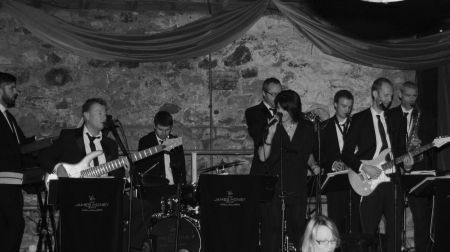 The James Honey Band is firmly established as a fresh and sophisticated all-round function band playing a mixture of styles, from up-tempo Swing and Rock n' Roll to Soul, Latin and Jazz not forgetting their versions of some current and classic chart hits. Fantastic to dance to, great to sit back and listen to. Combining years of experience in a variety of musical backgrounds, this highly talented band provide an ideal entertainment option. The luxury of having male and female vocals mean that a wide variety of songs can be performed and in addition, a number of superbly arranged medleys help to set this band apart from the rest. Alongside these outstanding vocals is a wonderful horn and rhythm section with some of the most talented and in-demand musicians available. You can trust them to take care of all your entertainment needs and ensure that all of your guests are inspired to dance the night away. For a free no obligation quote, Enquire Now or add us to your shortlist and we'll get right back to you. There are not many bands based in Hamilton, but of those that are, this is one of the best! The James Honey Band is also available to hire for your Glasgow wedding or indeed any where across Scotland! Sorry, The James Honey Band doesn't have any videos right now Send us an enquiry and we'll get back to you, or check out the rest of the act profile. Sorry, The James Honey Band doesn't have any photos right now Send us an enquiry and we'll get back to you, or check out the rest of the act profile. I have just returned to work today, So I wanted to thank you officially for the fantastic job you and your band did at our wedding at Drumtochty castle on Saturday 21st August. Stuart and I just wanted to pass on our thanks to you for putting on a great performance at our wedding on Saturday. We were both really impressed by how well the dance floor was filled throughout the course of the evening, particularly considering some of our friends are usually ones to shy away from the dance floor. You played a great mix of songs, including those which we specifically asked for, and Stuart was particularly impressed by your rendition of the Queens of the Stoneage song 'No one Knows' which was his final surprise for the day. Just wanted to say a huge thank you to yourself and the James Honey Band from me and Geoff for playing at our wedding on the 20th of September. The music was amazing and everyone who was at the wedding has raved about you! It was such a great atmosphere in there and Geoff and I were so proud that you were playing at our wedding. It had been wonderful during the daytime and you guys at night topped off a truly perfect wedding day. Anyway, I hope you are well- I suppose the wedding season will be slowing down a bit now? Maybe you will get a bit of a chance to relax, although perhaps I am very wrong!! Anyway thank you so much again. You have given me and Geoff such wonderful memories of that day. I just wanted to email and thank you and all of the band for the amazing job you did at our wedding on 1st September. We had an absolutely fabulous evening and it was due in large part to the music and the great atmosphere you all created. The quality of the music was fantastic and the mixture of songs was just right - I don't think the dance floor was ever empty! So many of our friends have commented on how good you were and have asked us your name - will be sure to recommend you whenever we can!